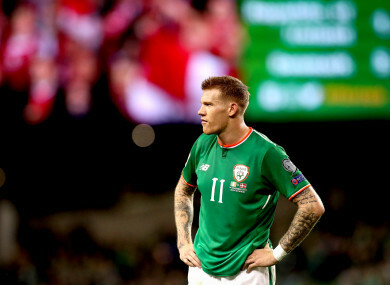 THERE HAS BEEN a backlash to the public’s decision to vote James McClean as 2017 RTÉ Sportsperson of the Year following the Ireland international’s win on Saturday night. McClean is widely admired in Ireland for his never-say-die attitude on the pitch, though some claim he experienced an indifferent year overall. He scored the winning goal in Ireland’s victory over Wales, but also could not prevent the team’s humiliating 5-1 defeat to Denmark that saw them exit World Cup qualification at the play-offs stage. His struggles to break into the West Brom first XI was also cited as a reason why some felt he was an undeserving winner of the prize. The winger overcame a list of nominees that included boxer Katie Taylor, rugby star Conor Murray, rower Paul O’Donovan and Mayo footballer Andy Moran. “Even by their standards, it’s pretty astonishing,” he said of the decision. ”I love his commitment to the team and it’s totally admirable. Kimmage went on to label the award a “popularity contest,” calling it “PC glorified,” while suggesting that future prizes should be determined by a panel of experts rather than a public vote. “No Paul Dunne, who wins a European Tour event in a sport that is massively competitive,” he added. Email “'By no means is he a sports star of the year'”. Feedback on “'By no means is he a sports star of the year'”.